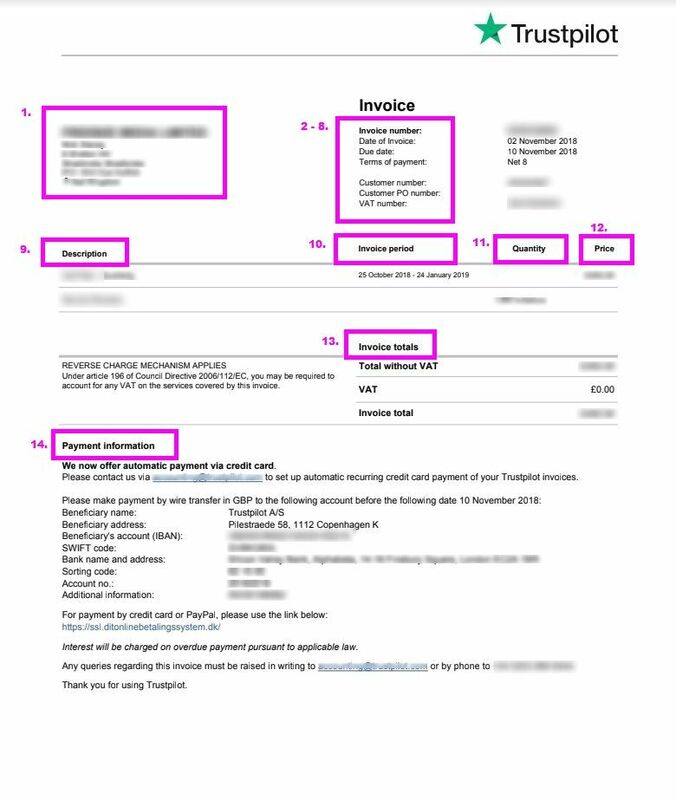 This article explains each element of a Trustpilot invoice, which can be issued in several different languages, according to your account preferences. Your company's name and address according to the details you provided when you set up your account. The unique reference number given to each invoice we send. This lets us identify it in our system. The date the invoice was created. The date that the invoice must be paid to avoid late fees. The length of time that the invoice must be paid according to the terms in your contract. The unique reference number that identifies your company. The unique reference number, or purchase order (PO) number, that you provided to us. Not all companies provide us with PO numbers, so this field may be blank. Your company's registered VAT number if you are based in an EU country. Note: If you are based in an EU country and do not have a valid VAT number, you will be charged 25% VAT. This only applies to companies who receive invoices from Trustpilot A/S. A brief description of the product or services you currently pay for with Trustpilot. Most invoices will only have one or two items, such as Pro Plan or Enterprise Plan. Each item appears on a separate line. The length of time that this invoice covers. The quantity of each item that is included in the invoice amount. In this example, the price includes 3,000 service review invitations per month. The price of each item on the list, including any multiples. Information on how you can make a payment. This includes how to set up regular automated payments, and bank details for payment by wire transfer. You can also find out who to contact with questions about your invoice and for information on overdue payment fees.